I enjoyed the spring Woodland Beach Quilt Retreat the first weekend in February. As in the past, the accommodations are outstanding, the food was wonderful, and the fellowship and inspiration from other quilters was beyond belief, in my opinion anyway! I can't say that I accomplished much in the way of quilting or sewing, but I was able just to relax and enjoy the accomplishments of others. I did finish one of the projects for the weekend. 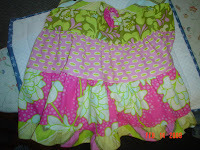 I made the child's apron featured in the Winter 2008 Issue of "Quilts & More" magazine. It's called the "Frill Seeking" apron. I plan to make the adult-sized version soon. Here is a photo of my finished project is above on the right. I also finished a "UFO" (unfinished object). I made purses for my nieces for Christmas presents. I began with one for me, but made a mistake by sewing on the front pocket upside down. I had set it aside over the holidays. The retreat seemed a good time to correct my error and finish it. 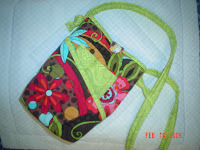 This is an Atkinson Designs pattern called "Tag Along Tote". It really is a cute purse. I modified the pattern by putting a fabric-covered button closure on the front instead of a zipper in the top of the bag. The bag is pictured at the left. I guess I also only used one handle instead of two, as I ran out of fabric. I was also able to make three pillowcases at the retreat. All in all, not a lot accomplished -- only 5 completed small items, but I did only attend for one full day and parts of two days. I will share about our group project in the next posting.